Any ice cream fans here? Mmmmm! We are definitely ice cream lovers! There is always a half gallon in our freezer and cones in the pantry. With summer only a few weeks away, I’ve been thinking about when I was a kid and having homemade ice cream. I saw this post by Sheryl at A Hundred Years Ago, and my mind automatically went straight to childhood. I love how she describes how families celebrated holidays in the past. How fun! Her recipes always remind me of my grandparents because they are from 1916. My grandpa Abbe was born in 1916, which means his siblings were little kiddos when someone put their Maraschino Cherry Ice Cream recipe into the world. How cool is that? Cherries in every form remind me of all the stories Dad has told me about the cherry trees of his childhood. Grandma Wilma had lots of cherries! Here’s to summer, family celebrations, potlucks, and of course, ice cream! Thank you for letting me share, Sheryl! Can’t wait to make this! Memorial Day in years gone by was often celebrated by parades and local festivals – and incredible homemade ice cream. 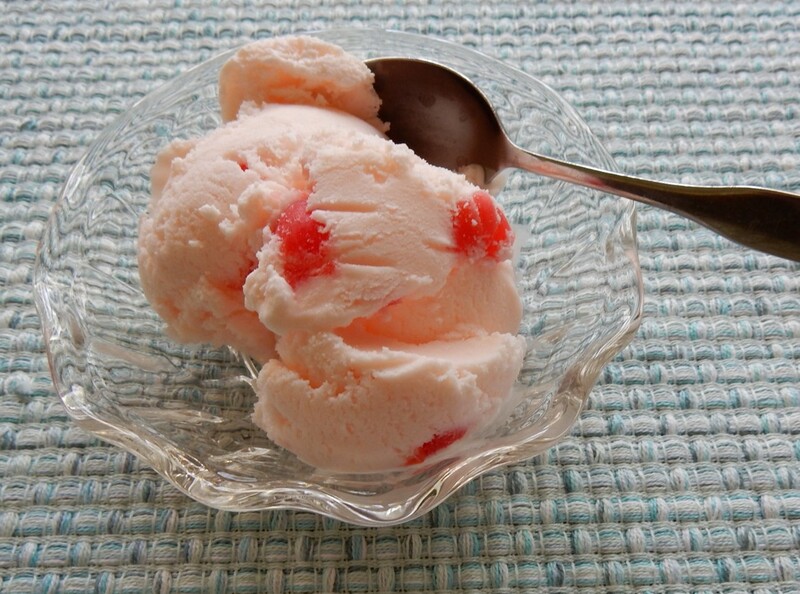 An old-time favorite was Maraschino Cherry Ice Cream. I tend to think of Maraschino cherries as a cocktail garnish (or an ingredient in canned fruit cocktail), but Maraschino cherries were a popular recipe ingredient in the early 1900’s. Back then the cherries were a pricey delicacy, and a popular ingredient that hinted of sophistication and class. Thank you for reading! Sheryl posts the best old fashioned recipes and history. We had a great holiday. Did you? We did as well; took Alaska to our local Memorial Day parade, but she started acting up around the police on horses and motorcycles (some of her triggers), so we had to leave quite early. I just wish she wasn’t as reactive to everything so I could take her with me to more places. No I haven’t but I’m intrigued! Will look into it, thank you! I learned a lot about pets and humans, for that matter. There’s a lot of info ably brain functions and behavior. Are you familiar with her? She is AMAZING. :) She designs cattle chutes etc.